It’s becoming hard to remember a time when the Doctor didn’t have attack eyebrows and that barbed Scottish brogue. The incomparable Peter Capaldi returned to our screens tonight in the first episode of Doctor Who, series 10 – “The Pilot.” It’s been 16 long months since the end of the last series, with only last year’s Christmas special to feed our addiction. I was pretty disappointed by “The Return of Doctor Mysterio” – its heavily Americanised superhero storyline didn’t gel with the British Gothic that showrunner Steven Moffat has cultivated since Capaldi stepped into the TARDIS. Yet “The Pilot” represented a return to form for Moffat; a soft reboot of the series that evoked the familiar sense of wonder even as it introduced us to new characters and mysteries. The anchor of this show continues to be Peter Capaldi. Gruff, flippant, arrogant, yet secretly warm-hearted, he is magnificent in the role of the Twelfth Doctor. His first season had a few stumbles, as if the scriptwriters weren’t quite sure how to handle his Who. But he made the role his own in season 9, and the last few episodes – especially “Hell Bent” – easily confirmed Capaldi as one of the great Doctors in the show’s history. 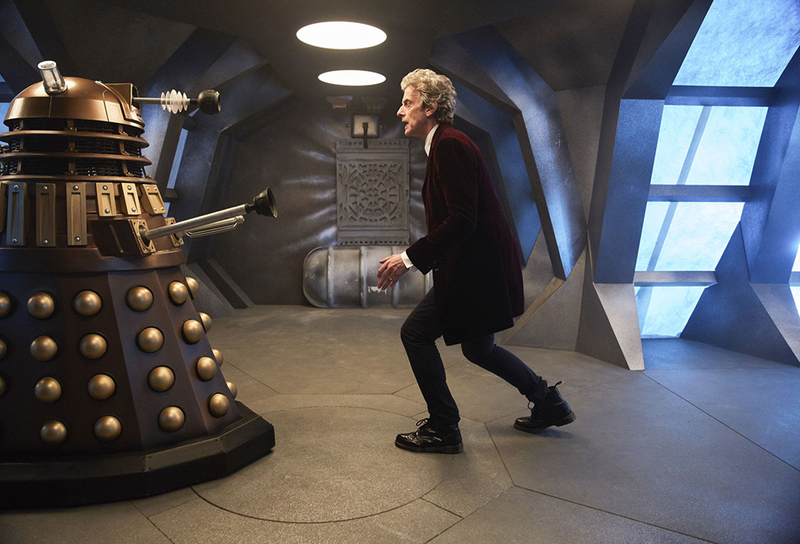 The Doctor faces off against a Dalek. “The Pilot” introduces us to a new companion: Bill Potts (Pearl Mackie), who works at a university canteen, but attends lectures in her spare time. 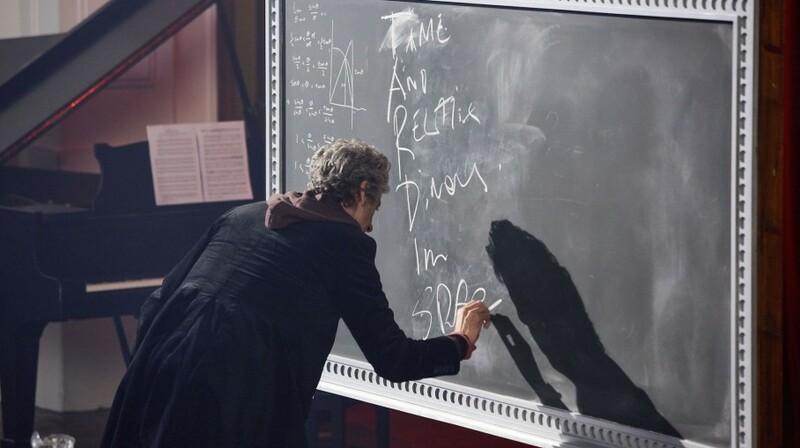 And who wouldn’t want to attend a lecture on quantum physics given by the Doctor himself? Bill is driven by her curiosity – a prerequisite for the role of companion – but she also grounds the more science-fictional elements of the show by voicing those niggling questions that we’ve all been wondering… If the Doctor is from another planet, how come the acronym for the TARDIS is in English? And, yes, Bill is the show’s first openly gay character. A celebration for diversity, especially as Moffat establishes it with a brisk matter-of-fact tone. Episodes that introduce new companions are often light on plot, but “The Pilot” successfully manages to weave Bill’s incredulity and the Doctor’s seemingly-flippant-yet-completely-concise explanations with a storyline about a shapeshifting alien fluid that is pursuing them across the universe. Business as usual for the Doctor. Pearl Mackie is delightful as Bill, falling easily into the role of companion and thriving in her chemistry with Capaldi. By the time she has an experience that marks the point of no return (the “Crossing of the Threshold,” to all the Joseph Campbell fans), her connection with the Doctor has been firmly established. Her sense of wonder is sure to ignite similar feelings in those watching at home. 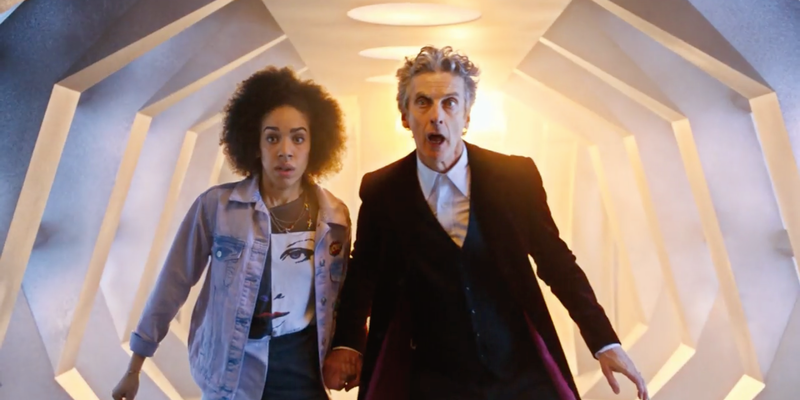 Pearl Mackie as Bill and Peter Capaldi as the Doctor. The title of the episode doesn’t hide the fact that this is essentially a soft reboot. The declining viewership of season 9 meant that the BBC needed to attract new fans. The episode functions as a perfect place for new fans to jump aboard, beginning in familiar university settings before hurling Bill and the Doctor across time and space, even finding time to have a quick appearance by the iconic Daleks. Bill’s incredulity and attempts to rationally explain the impossible are pitched as the perfect bridge to the audience – she echoes the wonder of new viewers, but evokes a certain nostalgia in seasoned fans, those of us who look back fondly on our own first encounters with the TARDIS. Perhaps the long break between seasons has reinvigorated Moffat’s passion for the show. There’s an enthusiasm here that has been lacking for a long time. “The Pilot” has some genuinely sublime moments, such as when Bill steps into the TARDIS and the Doctor begins to wax poetic about “science beyond magic.” Moffat certainly knows how to wring magic out of an idea that has been around since 1963. It also had some poignant links to the past. The photos on the Doctor’s desk serves to remind him of the heartache of losing those he loves. And the tinkling inclusion of Clara’s theme at the end of the episode shows how much he’s grown since the last season. The Doctor spells out a familiar acronym during his lecture. I’m still not entirely convinced by Matt Lucas’s character, Nardole. He has some great lines and comic timing, but his continued presence in the series is yet to be satisfactorily explained. Perhaps a BBC ploy to attract a wider viewership? Or, less cynically, perhaps it has something to do with the other questions that the episode raises: why is the Doctor working at St. Luke’s University, and what is he guarding in the vault? These questions are sure to be answered in coming episodes. Series 10 marks Capaldi’s final season as the Doctor. It’s also the final season for Moffat, as he hands over production to Chris Chibnall in 2018. If the first episode is anything to go by, they’re set to leave with a bang. 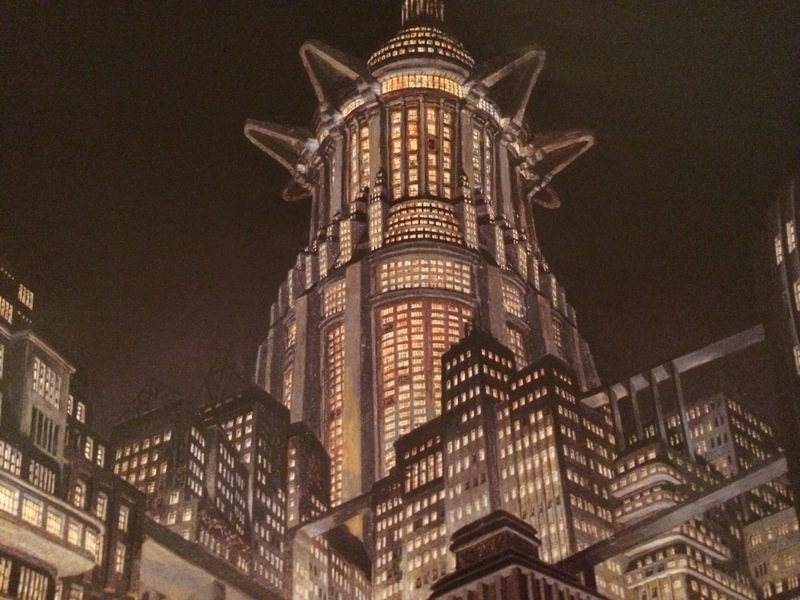 This is back-to-basics Who – fresh and engaging science fiction.